Meet Beefy. 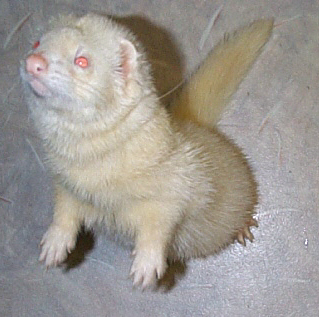 He was a big ferret. His physique was muscle, not fat. For all his size he was a very friendly chap. He had to be separated from his mum as he would pull her about, so that is how I obtained him from Fred. I noticed that he was deaf, as he did not respond to any sound, but would swiftly react to any thing in his field of vision. That said, nothing detracts from the fact he was a gentle giant. Beefy developed a lump on his throat, and became very ill, losing a lot of weight. this was successfully removed by my local vet using surgery & medication. To view this abscess. His recovery had been astounding. In March 2006 Beefy lost weight and suffered vomiting bouts. He under went an endoscopies to look for an obstruction. He was found clear but a sample was taken from a lesion in his stomach and was found to be benign. Mean while I altered his diet from dried food to minced tripe and the vomiting ceased and he has regained weight. The vet suggested the dried food expanding in his stomach might have irritated the lesion. During July 2006 Beefy became ill again, losing weight and was put to sleep.